Gardner Museum Offers Hefty Reward For Tips On Decades-Old Art Theft : The Two-Way It's been 27 years since thieves made off with more than a dozen works of art from Boston's Gardner Museum. But the museum's trustees hold out hope — and have doubled the bounty on the masterpieces. 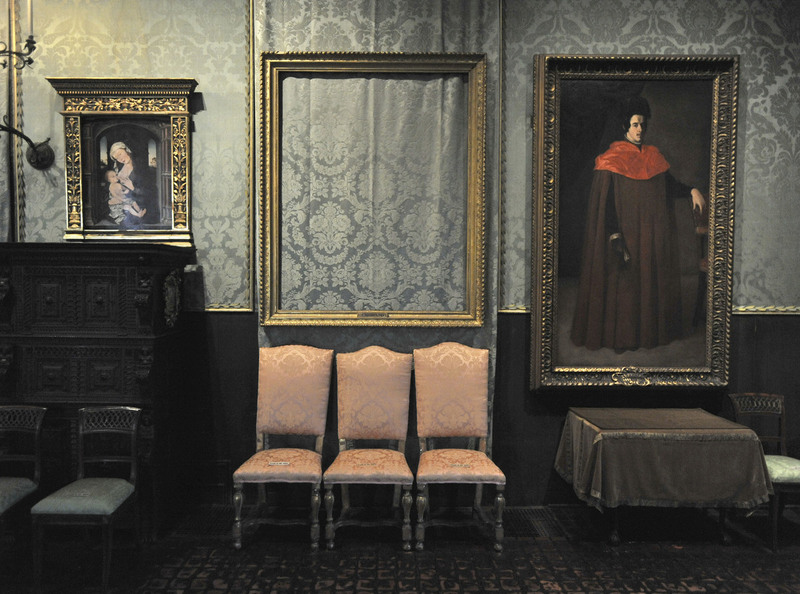 The empty frame (center) from which thieves cut Rembrandt's Christ in the Storm on the Sea of Galilee remains on display at the Isabella Stewart Gardner Museum in Boston in 2010. The painting was one of more than a dozen works stolen from the museum in 1990. Two thieves. Thirteen pieces of art. Twenty-seven years of mystery. And now, a $10 million reward — for anyone who can bring those missing masterpieces back to the Isabella Stewart Gardner Museum in Boston. Two men disguised as police officers made off with the paintings and sketches in 1990. It is still the largest property crime ever carried out in America, and the biggest heist from an art museum anywhere in the world. 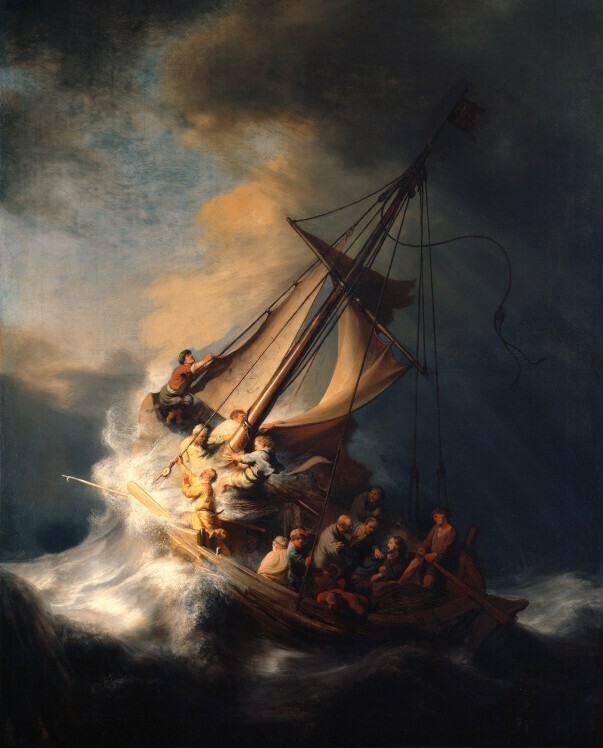 Christ in the Storm on the Sea of Galilee, a 1633 painting by Rembrandt, was stolen from the Isabella Stewart Gardner Museum in 1990. The treasures include Rembrandt's only known seascape and one of just 36 paintings by Vermeer. They're worth more than half a billion dollars. They have never been located. The search has never stopped. In 2013, the FBI said they were confident they had identified the thieves as two men tied to the mob ... or as the agency put it, part of "a criminal organization with a base in the Mid-Atlantic states and New England." Having suspects isn't quite as useful as it might sound, since the statute of limitations for the crime expired years ago. But the FBI also has a good idea what happened to the artworks, at least at first — they were smuggled to "the Connecticut and Philadelphia regions." Where are they now? The FBI doesn't have a clue. Somebody knows. The FBI and the Gardner Museum are sure of it. They believe that somebody, somewhere, at some time in the past 27 years, has caught a glimpse of a Vermeer or Rembrandt or Manet or Degas hanging on a wall or rolled up in a safe. If that someone is you, drop an email to theft@gardnermuseum.org. The museum's leaders "guarantee complete confidentiality" — and, if the tip leads to the artworks' recovery, a $10 million bounty. There's always been a reward for information leading to the artworks' discovery. Within days of the theft, the trustees promised $1 million. The sum was boosted to $5 million in 1997. Now it's been doubled — temporarily. "The increased offer is available immediately and expires at midnight on December 31, 2017," the museum says in a press release. The limited-edition boost in the reward is meant to signal that the search is still ongoing and enthusiastic. If you've got a tip, the museum and authorities really, truly want to know. "Typically stolen masterpieces are either recovered soon after a theft or a generation later," Anthony Amore, the director of security at the museum, said in the statement. "We remain optimistic that these works will ultimately be recovered." Rick Abath was the security guard who said he was tricked by the ersatz policemen into opening the door for them. He spoke to StoryCorps in 2015, and said he's still angry about what happened. The thieves sliced two of the Rembrandts straight out of their frames, he noted. "So even if they get the paintings back they'll never be the same," he said. "And I feel horrible about that." Also in 2015, Boston Globe reporter Stephen Kurkjian explained to NPR that the works are essentially impossible to sell, as incredibly valuable and recognizable stolen goods. He said one theory for the heist is rooted in the idea that "the authorities, whether they be federal or state, will do anything to get that artwork back" — so it can serve as a "get out of jail free" card, or at least a "transfer to a lower-security prison" card.